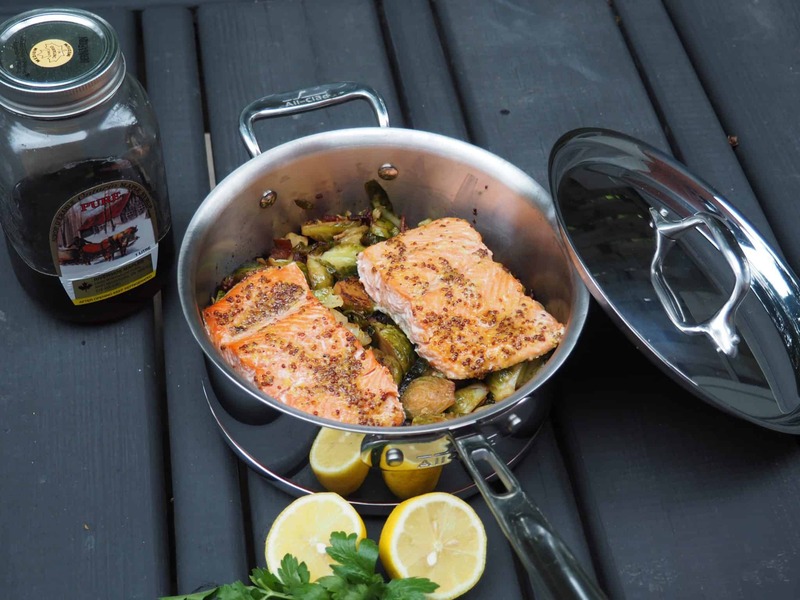 This EASY Maple Mustard-Glazed Salmon with Roasted Maple Bacon Brussels Sprouts recipe is both quick AND delicious! 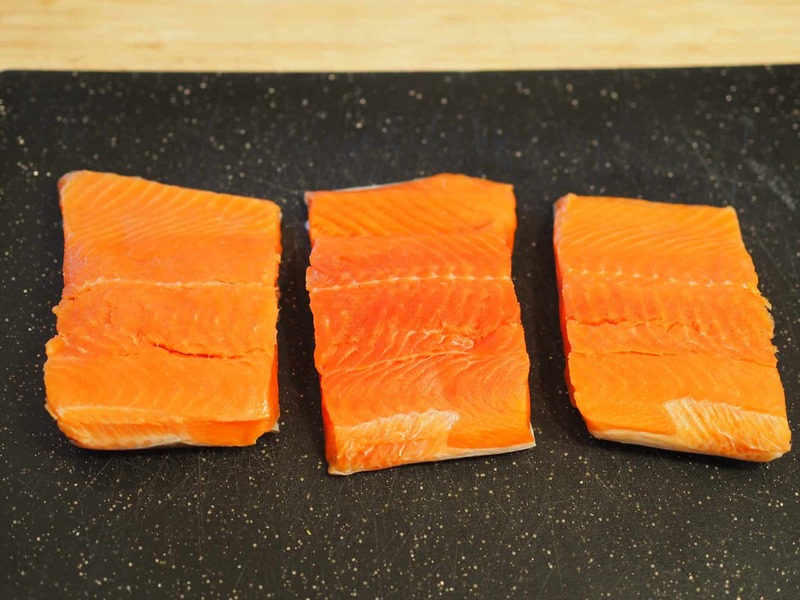 Don’t forget all those omega-3 fatty acids you get from eating this wonderful fish that cooks in no time. 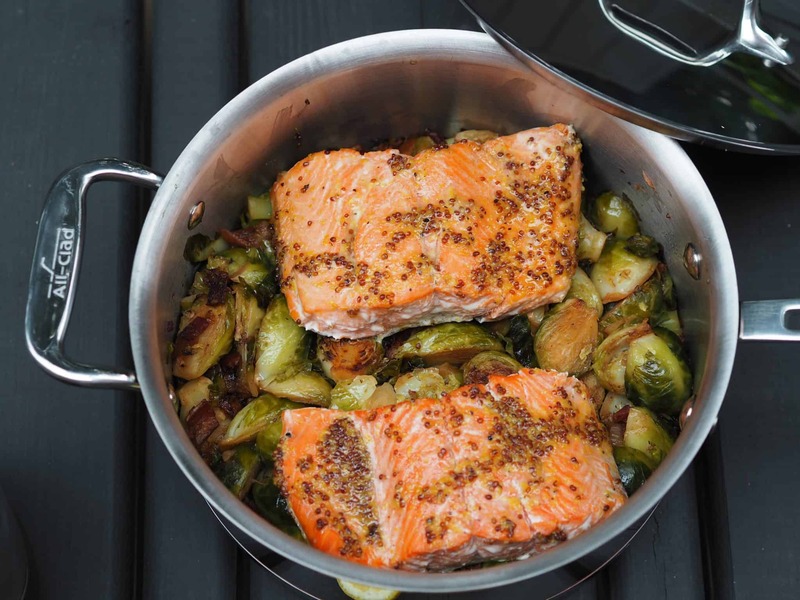 My kids who usually are not fond of fish dishes loved the salmon and ate all the Brussels sprouts. I love using local Canadian ingredients and produce. 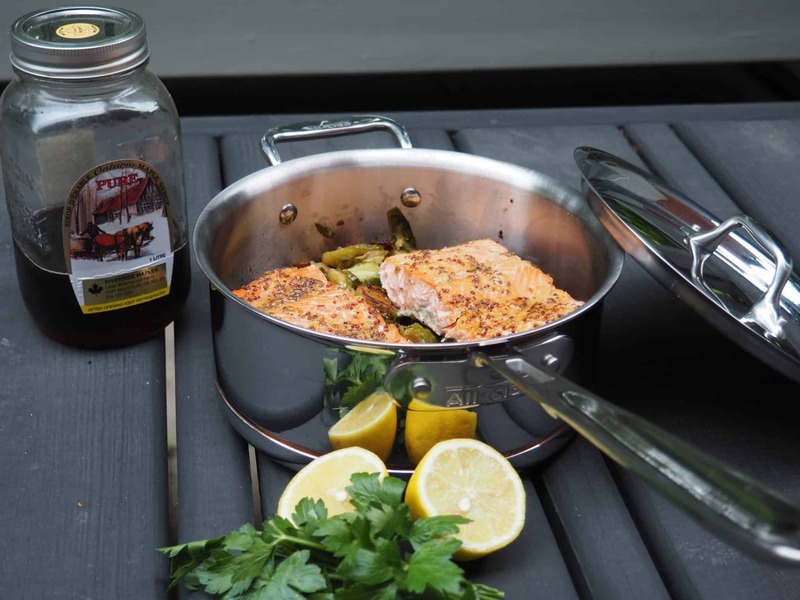 Although maple syrup is used for breakfast dishes, it gives this dish that slightly sweet maple taste and pure Canadian maple syrup features 65 different antioxidants. 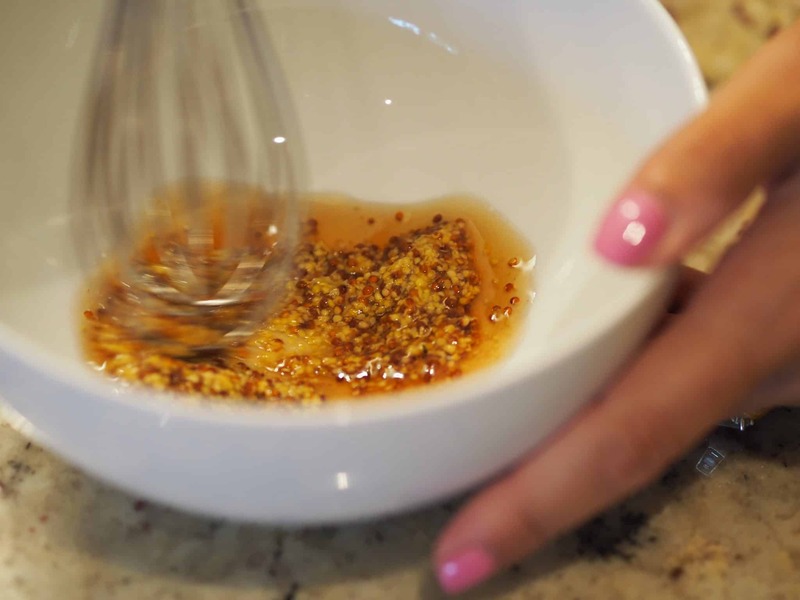 Whisk together the Canadian maple syrup and mustard. 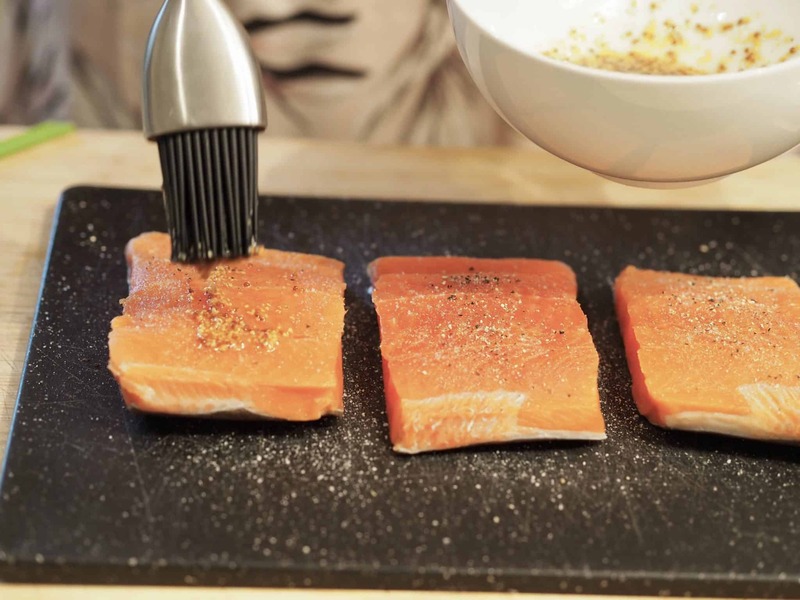 Season both sides of the salmon fillets liberally with salt and pepper, then brush them with the maple-mustard mixture and set aside. Meanwhile, heat the oven to 450°F. 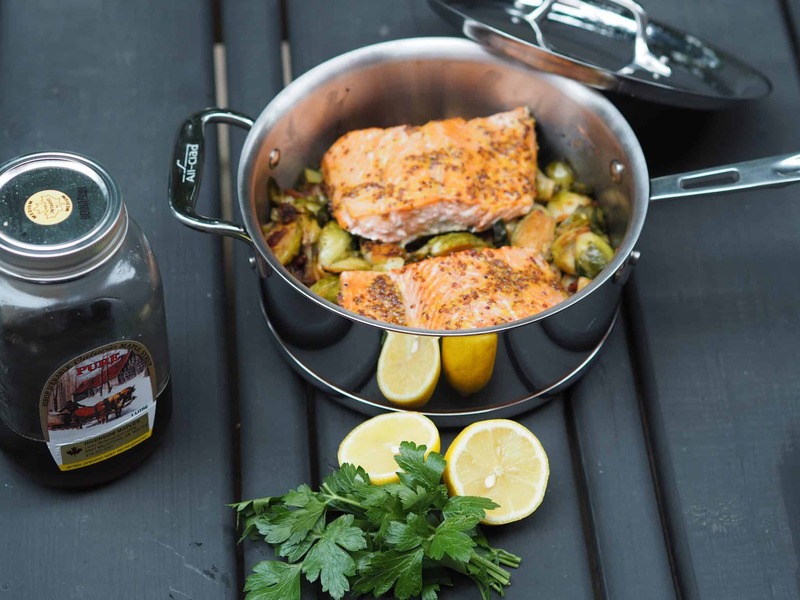 In the All-Clad d5 Stainless 3-Qt Essential pan, add the bacon and onion with the olive oil, 1/2 teaspoon salt, and 1/4 teaspoon black pepper until well-coated until onions are translucent. 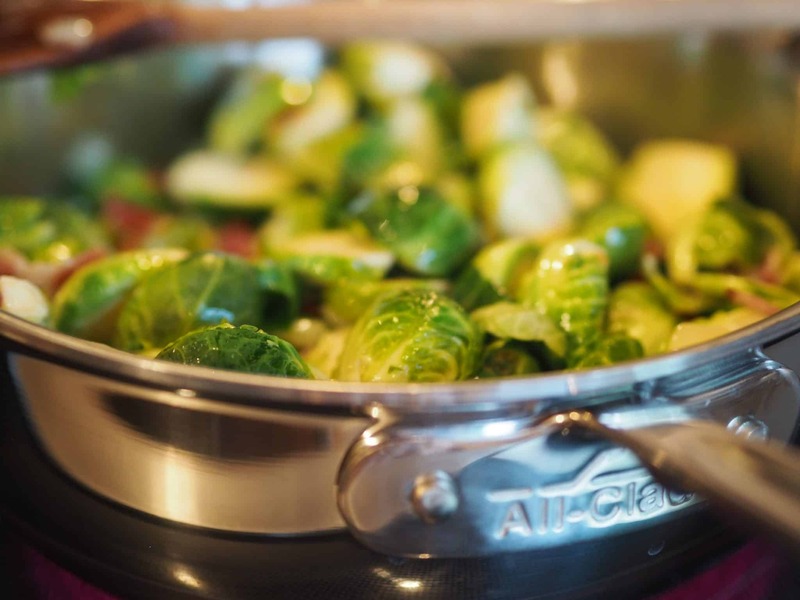 Then add the halved Brussels sprouts and cook under medium heat until tender. 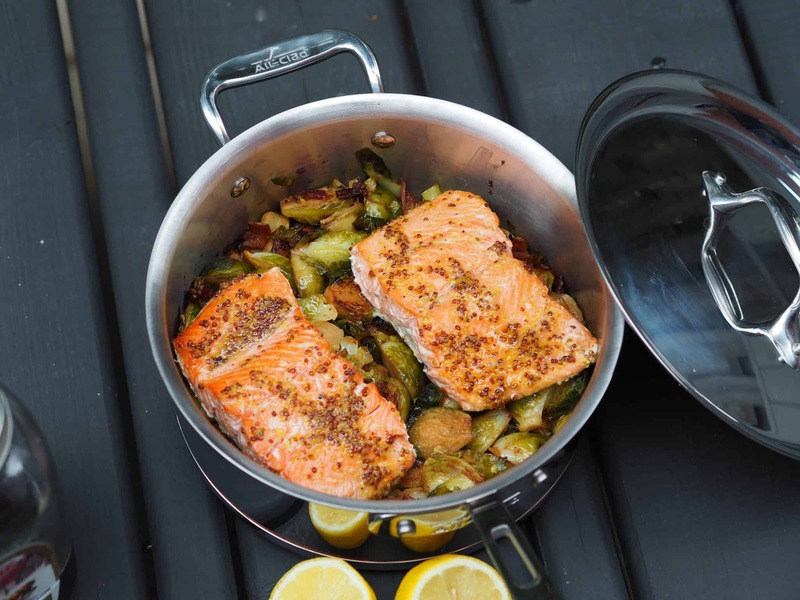 When the sprouts are nearly done drizzle with 1 tablespoon maple syrup, arrange the seasoned and glazed fillets in the All-Clad 3 QT Copper Core Saucepan, broil them, skin-side down, until the maple mixture is well-caramelized and the fish is just cooked through—7 to 10 minutes, depending on the thickness of the fillet. 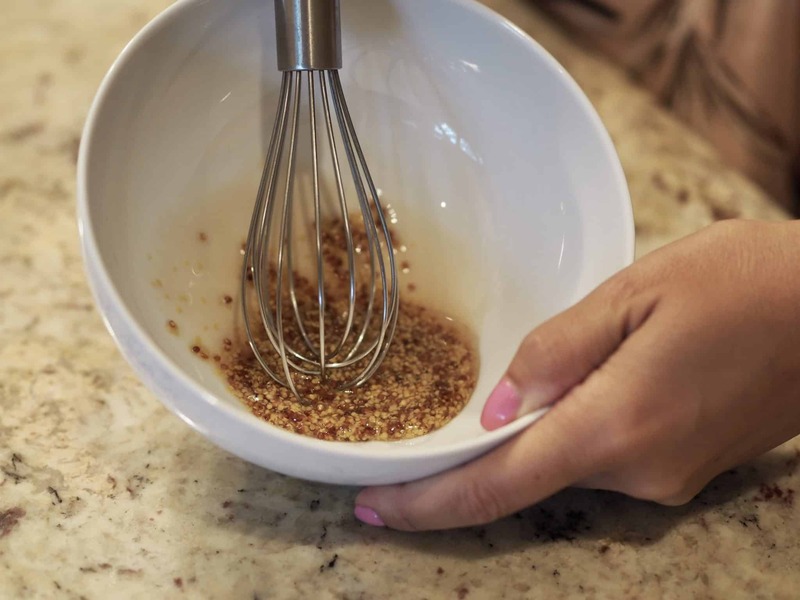 Whisk together the maple syrup and mustard and set aside. 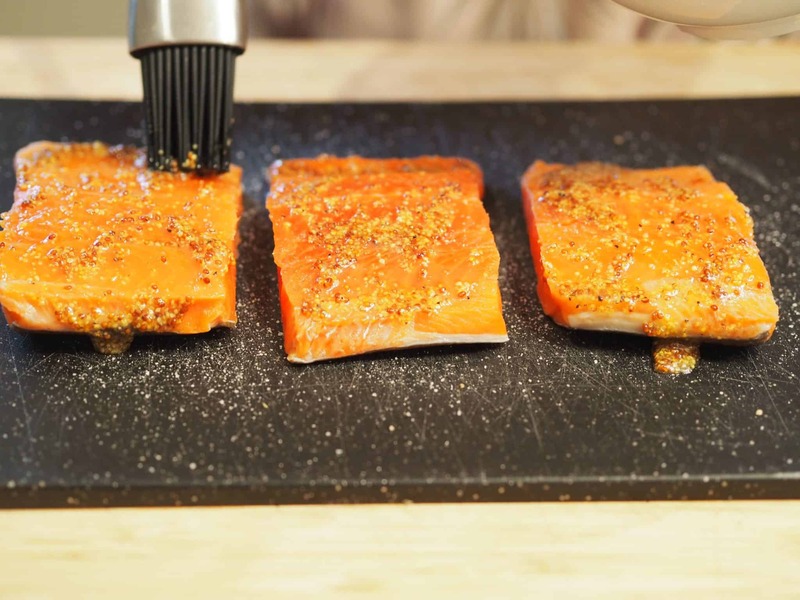 Brush the salmon fillets with the maple-mustard mixture and set aside. 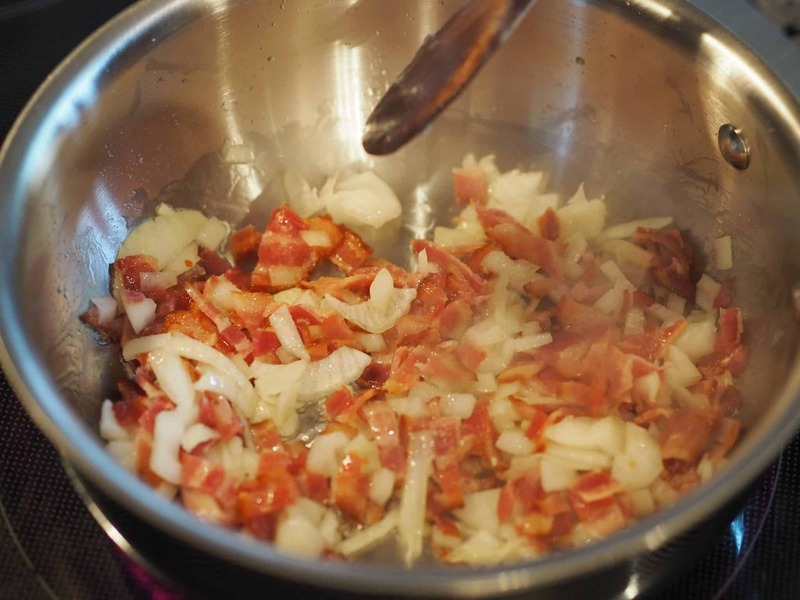 Meanwhile, In an All-Clad d5 Stainless 3-Qt Essential pan, add the bacon and onion with the olive oil, 1/2 teaspoon salt, and 1/4 teaspoon black pepper until well-coated and sauce until the onions are translucent. 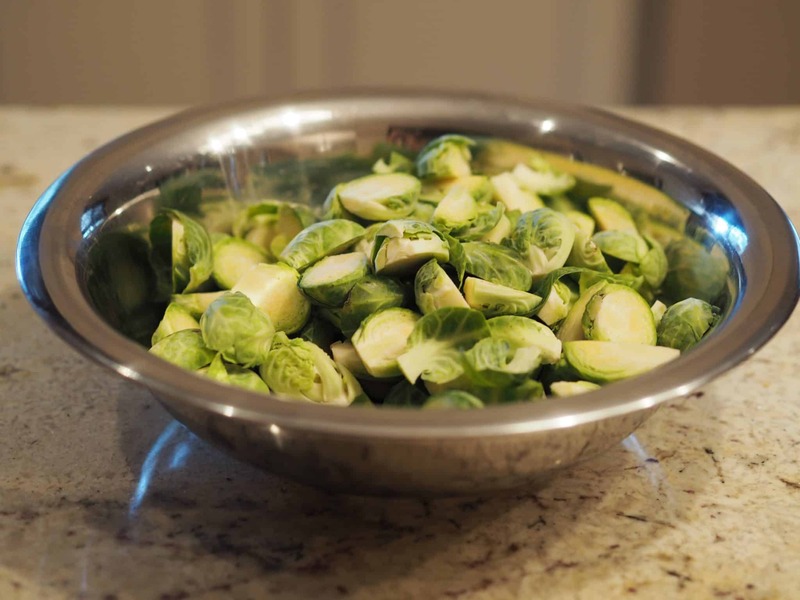 Then add the halved Brussels sprouts and cook under medium heat until tender. 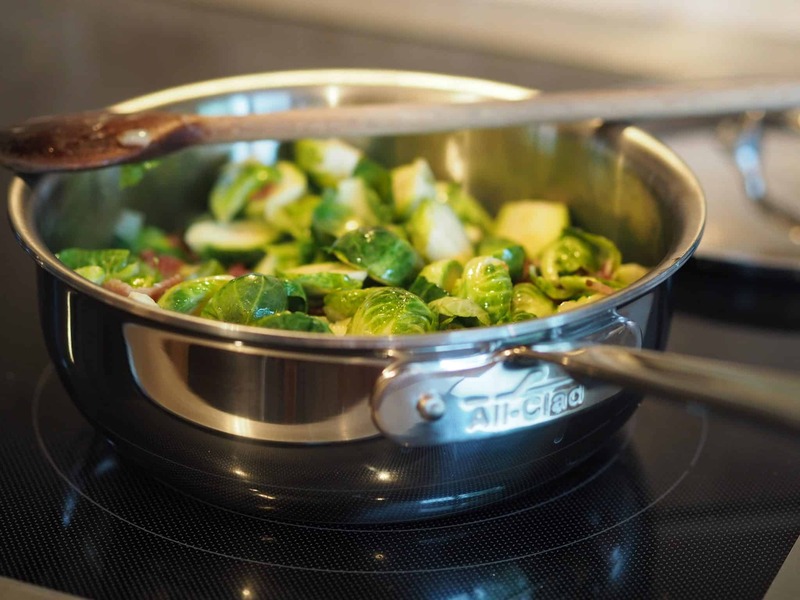 When the sprouts are nearly done drizzle with 1 tablespoon maple syrup, arrange the seasoned and glazed fillets in the All-Clad 3-QT Copper Core Saucepan, broil them, skin-side down, until the maple mixture is well-caramelized and the fish is just cooked through—7 to 10 minutes, depending on the thickness of the fillet. 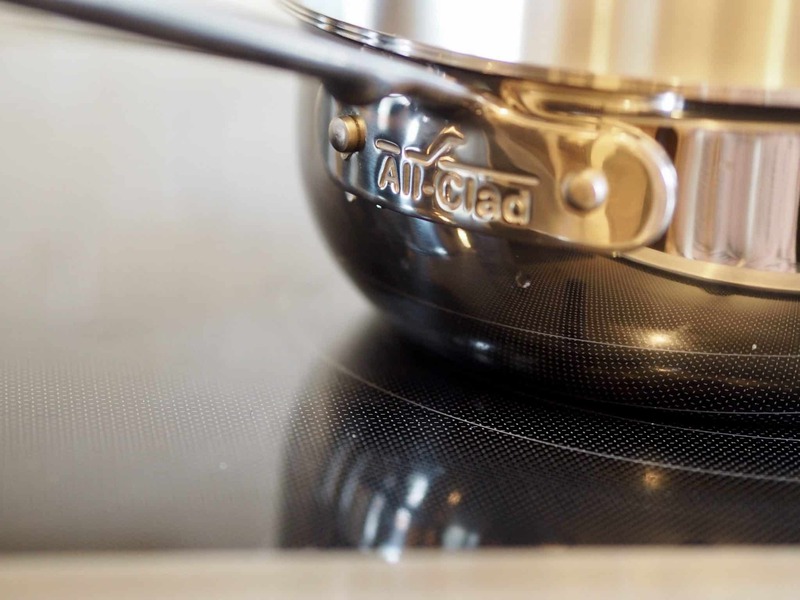 I’ve partnered with All-Clad to share their stunning All-Clad d5 Stainless 3-Qt Essential pan and the All-Clad 3-QT Copper Core Saucepan with one of my lucky Instagram followers. Head over to my Instagram to enter the contest. I love this superior product line. 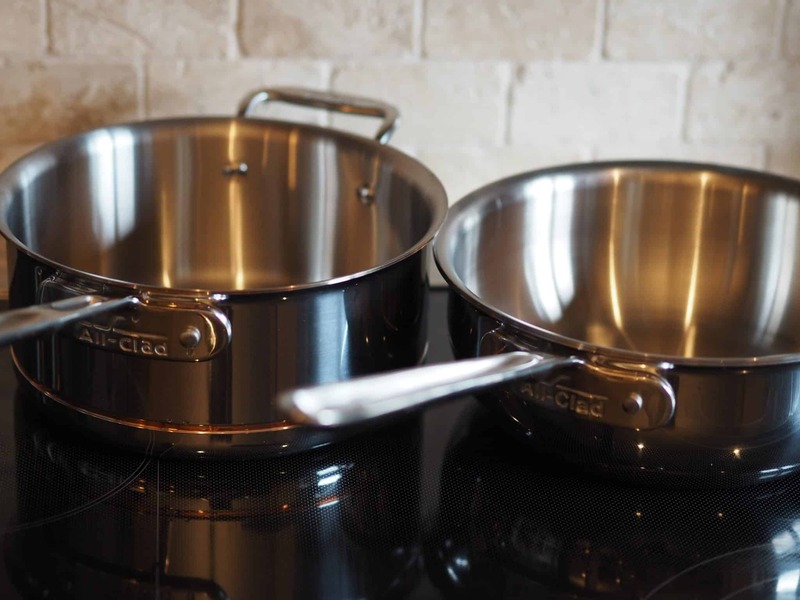 If you cook as much as my family does then you will want cookware that has exceptional performance and precise heat control. 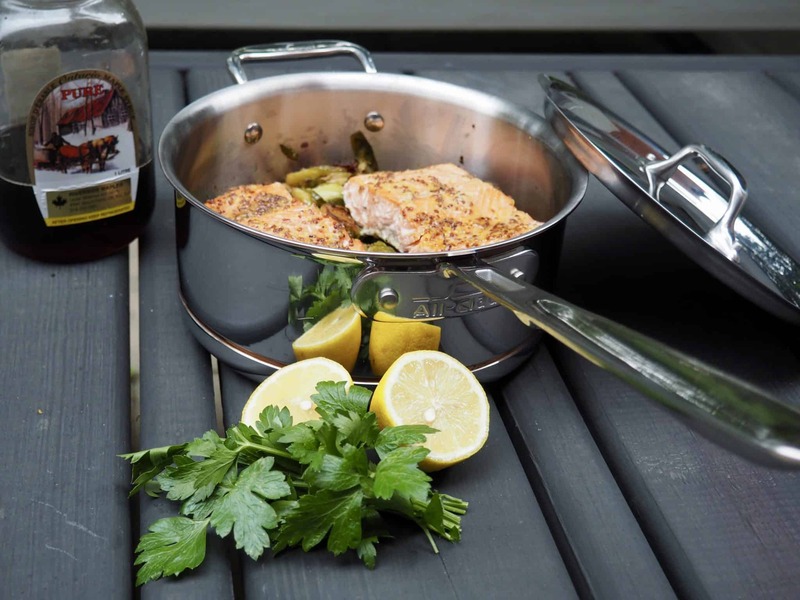 With the copper core, you are getting superior cooking, and even heat retention. i met YOU last night – ur so fun …..